First published: Startling Stories, September 1952. Related: Stories of Roger Dee. 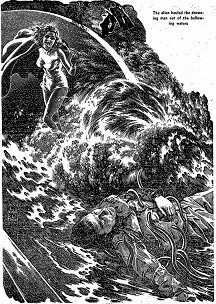 [novelette] Roger Dee's "The Obligation" (B); read online; Startling Stories, September 1952: An alien visitor's adventures at a human fishing camp on Venus. [ss] Robert Moore Williams' "The Sound of Bugles" (B): Couple of humans' adventures among Martians. Murray Leinster's "Assignment on Pasik". 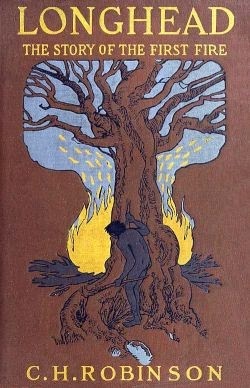 [novelette] A E van Vogt's "The Rull"; Astounding, May 1948. 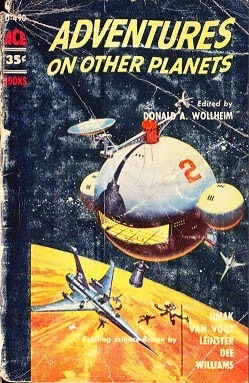 Related: Anthologies & collections; works of Donald A Wollheim. Download full text from Project Gutenberg. I actually picked it up expecting an adventure, & got disappointed. It's readable enough, if you are in mood for a slow moving story in scenic locations with far too much descriptions & far too little dialogs or action. Story is mostly set in Dal, a small town in Norway. A family of 3 Hansens - mother, daughter, & son, running an inn. 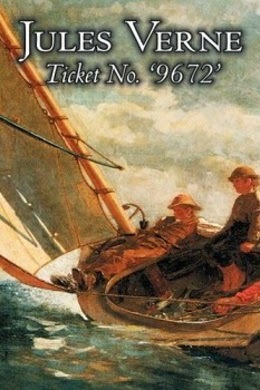 Daughter's fiance has gone on a fishing expedition to Newfoundland, & the marriage is expected on his return; only his ship gets wrecked at sea, with all presumed dead. Eventually, a bottle is found at sea, containing a lottery ticket bearing the number of story's title, & a farewell message at its back for the girl from fiance. News spreads, people get superstitious about the number, & begin sending bids to buy it. Add an influential man who'll get fond of the family & will move mountains to get positive proof of the sailor's death. Download full text from Project Gutenberg, Feedbooks. Related: Stories of Jules Verne. 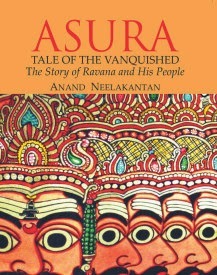 Anand Neelakantan's "Asura" (novel): Retelling Ramayan from the point of view of Ravan! This post may not make a lot of sense for readers outside South Asia. Ramayan is a well known epic here, & my commentary below assumes familiarity with it. While there have been many retellings of Ramayan, they mostly don't question its premises, heroes & villains. This one is unusual in that it tells Ramayan from the point of view of Ravan, & from the point of view of an ordinary Asura citizen of the period. Apart from questioning a lot of premises of Ramayan, it uses the opportunity to make commentary on modern India - high growth rate that is invisible to poorer & less skilled sections of society, skin color prejudices, politicians claiming & appropriating far more resources & rights compared to ordinary citizens, ... It also devotes a lot of space to caste system, though I find its rigidity completely unfamiliar; may be times have changed! 10 heads of Ravan represent him as a complete man, as against a saint. I don't remember the list of 10 attributes he lists, but they're like one head for lust, another for wisdom, another for greed, ... Ravan is a man, with all the failings it implies, & doesn't aspire to be a God by overcoming what are claimed to be human "shortcomings". Sita is Ravan & Mandodari's eldest child! Someone foretells that she will bring destruction to the family & clan, so a lot of people want her killed when she's a baby. To protect her, Ravan takes her with him during a campaign north. But those fearful of future conspire to plan her killed even here; only the man charged with disposing her off doesn't have heart to murder a helpless baby & manages to have her found by Janak. Ravan kidnapped her later to protect her from Ram, whom he thinks is unworthy of his daughter. It sets up the stage as a conflict between Devas & Asuras. India is initially owned by native tribes of Asuras, Kinnars, Nagas, etc. Deva invaders have come from Central Asia, & Indra is the first of the successful raiders. Asuras are a casteless society; Devas have brought casteism with them. Vanars are half castes - mix of Devas & Asuras, unwanted by both. They inhabit central India, acting mostly as a buffer zone between Asuras & Devas. Brahma is not a god but a clan of teachers, one of whom will teach Ravan in his young years. Story isn't always consistent, though. It takes pains to tell us Vanars are nothing but ordinary human half castes, & yet they move up trees & buildings far more nimbly than most men, & are often referred to as "monkey men". I think there is a place before Lanka Dehan where Hanumanji's tail is referred to! And there is reference to steel somewhere during fighting in Lanka; did steel even exist in the period the story is set in? Dashahara: (Incidentally, today is Dashahara.) What does it tell us about Indians as human beings? That we are a vengeful unforgiving lot? Even assuming everything in classical Ramayan is true, Ravan got death as his punishment. Why do we still keep taking revenge by burning his effigies? Lanka Dehan: Assume that the Prime Minister does something stupid. As a revenge & to put pressure on him, someone comes & bombs your neighborhood. What would you call this avenger? A lot of innocents must have died when Lanka was set on fire! Why do we never discuss it? Disfigurement of Soorpnakha at the hands of Lakshman: Why do we simply brush it aside? OK - so she was promiscuous & was trying to entice Lakshman. Does that justify cutting off her nose? Agni Pareeksha & the exile of a pregnant Sita: I've heard pious explanations for it but never found them convincing. This book imagines the dirty details to make you squirm. Mangalyaan, India's maiden Mars probe, is now orbiting Mars!